After all of Darkness’s (and Kali’s – she’s just too smart to allow herself to be photographed) hard work blocking, the Summer Mystery Shawlette is done. I have to say I’m pretty pleased with the way it turned out. Knitting it up was kind of an adventure. When I started knitting, I cast on a whole bunch of stitches and it decreased from there. I thought I was working to a point right up until I cast off. 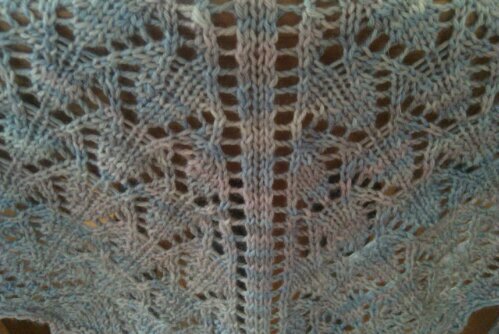 To my surprise and delight, I realized my last K3tog was actually across the straight edge of the shawl. It was a little pointy on top after the cast off and the lace more resembled a block of Ramen noodles than lace. The blocking pins kept the ends nice and pointy and the wires made keeping the top bit straight really easy. Although, threading the shawl onto the blocking wire was a giant PITA with with both cats pawing at the end of the wire that wasn’t in my hand. I was sure the shawl would dry before I was able to get the darned thing onto the wire. But lo, I persevered and have a lovely shawl to show for it! My darling Mr Liu needs to come up with a birthday gift for his mother, so this shawl will be going to my MIL at the end of the month. I hope she likes it. This entry was posted in FO, gift knitting. Bookmark the permalink.